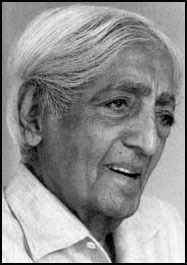 Krishnamurti - as always - tells it like it is: Religion is not what you think it is. Religion is the feeling of goodness, that love which is like the river moving everlastingly. In that state you will find there comes a moment when there is no longer any search at all; and this ending of search is the beginning of something totally different. The search for God, for truth, the feeling of being completely good - not the cultivation of goodness, of humility, but the seeking out of something beyond the inventions and tricks of the mind, which means having a feeling for that something, living in it, being it - that is true religion. But you can do that only when you leave the pool you have dug for yourself and go out into the river of life. Then life has an astonishing way of taking care of you, because then there is no taking care on your part. Life carries you where it will because you are part of itself; then there is no problem of security, of what people say or don’t say, and that is the beauty of life. I have just come across a New Scientist text by A. C. Grayling I had picked up awhile ago, What is this thing called religion? He points out a distinction between religion and religiosity. This is because "religion" and "religiosity" are very ill-defined terms. Today's major religions are relatively young, and they share features - such as belief in a single supernatural agent that is actively interested in the affairs of human individuals - which are novelties compared to most of history's religions. What a Roman or Greek of the classical period believed was quite different. For the Romans, religion was a matter of public social cohesion rather than personal spirituality, and the attitude of individuals to their household gods and guardian deities was equivalent to a form of knocking-on-wood superstition, useful chiefly for protection and luck. Moreover it is not clear that "primitive" religions were religions at all, as we have come to understand the concept; they were more like rudimentary forms of science and technology. It seems likely that their espousers did not regard gods and spirits as supernatural, but as straightforward parts of nature, operating in fairly systematic ways as instigators of wind, thunder and other natural phenomena, and amenable to manipulation through sacrifice and observance of taboo. There is a marked difference between someone who holds contemporary Christian evangelical views and an ancient Egyptian who literally felt his god on his back - Ra, the sun - every day of the week. To think that there is something in the brain or its function which specifically gives rise to "religiosity" is not consistent with the idea of major differences between what we now think of as religion and what people long ago believed and did. It is plausible that a generalised propensity to credulity in childhood is a successful evolutionary adaptation, and that this might have been culturally annexed by religion as social complexity increased. If so, the concept of religiosity is going to need all the historical and anthropological clarification it can get before a computational model of its dynamics becomes possible.